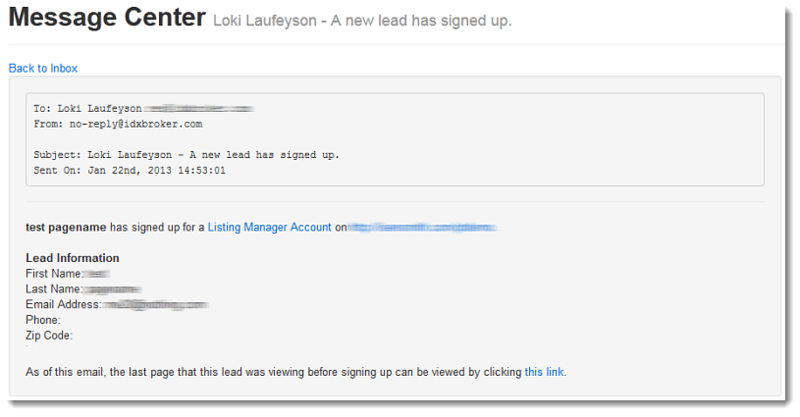 Your Message Center tracks all the email notifications sent by the system to both you and your leads. You will get a variety of notifications via email from the system regarding new lead notifications, contact forms, requests for more information about listings, possible billing issues, etc. Your leads will get automated updates from the system if they have saved any Searches or Properties. You can view a report of all of these messages easily in your IDX control panel underAccount in the main menu, and Message Center in the submenu. You will see a list of all messages specific to your account. To view a message, simply click on the subject. You can sort your messages, and mark them as read/unread. You can also filter the list of messages by using the Filter Messages link at the top right of the message list. Messages in the "Sent to Me" filter will include new lead notifications and emails from IDX Broker regarding your account, billing or support issues. Messages in the "Sent By Me" filter will include verification emails and property updates sent out to your leads.